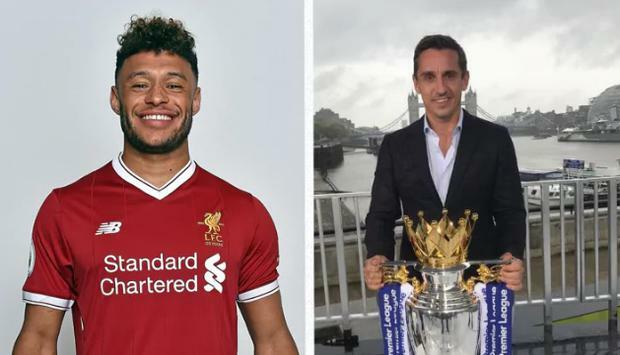 Gary Neville believes Alex Oxlade-Chamberlain's will strengthen Liverpool's squad, but not their first team. Oxlade-Chamberlain joined Liverpool in a £35m deal on deadline day, after turning a down a new Arsenal contract, believed to have been worth £180,000-a-week. Speaking to Sky Sports, Neville revealed he did not believe Oxlade-Chamberlain would earn an automatic starting place in Liverpool's first team. "He doesn't get in the best XI," Neville told Sky Sports News. "(Philippe) Coutinho, (Emre) Can, (Jordan) Henderson, (Adam) Lallana, (Mo) Salah, (Roberto) Firmino all play in front of him. Everyone seems to eulogising over him in the last 24 hours, but he doesn't get in the best XI and strengthen their team. "He does, however, strengthen their squad - he's a player who could play in Jurgen Klopp's style. He's got a huge amount of talent and is a decent lad but he has three or four areas of his game which he has to significantly improve. "The biggest being his focus and concentration and being a really top professional. I think his injury record is poor, too, he'll need to work hard to stay fit. "Also, his impact in terms of his assists and goals. With the Champions League and Premier League, he'll be an asset for the squad." Neville, who worked with the 24-year-old is in his role as an England coach, admitted he was surprised by the fee paid for the midfielder's services. "If you had said to me six months ago that you'd get £40m for Oxlade-Chamberlain, you'd snap your hand off and you'd say it's a brilliant deal [for Arsenal]," said Neville. "I'm not sure why that's shifted the opinion as he's still got to prove himself. He wants to do well, but he needs to step up from being in a comfort zone."